If you’re embarking on an epic journey across many time zones, the likelihood is that you’ll have one of those stopover flights where you get stuck in the airport for a couple of hours trying to figure out the exchange rate and entertain yourself by people watching everyone else in transit. If you’re not in a rush though, why not plan a layover? Whether you’re headed to Sydney via Singapore or New York via Reykjavik, imagine how much more awesome your trip will be if you added an extra destination to your itinerary. We asked some of our fave jet-setting travel bloggers (and one of our own Hostelworld squaddies) to recommend the amazing things to eat, see and do in the world’s best layover cities. For a taste of multiculturalism in southeast Asia, it’s hard to go past Kuala Lumpur (or just KL). The Malaysian capital is a sprawling urban city that combines a little grit with a whole lot of cultural curiosity. No visit to KL is complete without a trip to the iconic Petronas Towers. Walk out onto the Skybridge (41 floors up) that joins the two and, with good weather, you can get some pretty special views. Quite the sight from the ground, the towers are at their best at night thanks to a dazzling light display. To experience different sides to Malaysia, visit neighbourhoods like Little India or Chinatown. Walking the streets of these areas you start to comprehend how diverse KL, and in fact Malaysia, is. Also worth visiting is the revitalized riverfront along the Klang River. Here you’ll find beautiful landmarks like the Jamek Mosque of Kuala Lumpur and the Sultan Abdul Samad Building. Escape the city between your stopover flights with a visit to the legendary Batu Caves. These expansive limestone caves are home to a number of Hindu temples and are guarded by a 42-metre-high statue of a Hindu god. Honestly though, you could just spend your entire time in Kuala Lumpur gorging on delicious Malaysian food – and you can find great food from all over the country at night markets and even shopping malls. It may seem strange, but head to the food courts of shopping malls like at KLCC and alongside locals enjoy must-have dishes like national rice dish Nasi Lemak or delicious Char Kway Teow noodles. For something spicier, consider the Rendang curry or Laksa noodle soup. For dessert try Cendol, a treat with icy coconut milk and green jelly noodles – it sounds odd but it’s delicious and great for cooling down. Popular places to stay at in KL include Brickfields and Chinatown, but especially Bukit Bintang for its shopping and bars. Getting about the city is easy with its train and monorail network, not to mention Uber. From glittering wats to rooftop bars, the city of Bangkok offers many ways to revi-Thai-lise your spirits between flights. There are more than 400 temples or ‘wats’ spread across Bangkok, each with its own unique awe-inspiring architecture. The question is, if you’re only stopping over, what temples should be at the top of your list? Based on their beauty, cultural significance and importance within the Buddhist religion, I suggest including Wat Arun, Wat Pho, Wat Saket, Wat Phra Kaew and Loha Prosat on your stopover itinerary. The best part is that all these temples are located in the centre of Old Bangkok and within 30 minutes walking distance from Khao San Road. During your visit, be sure to keep in mind that these temples are sacred places, so you must dress appropriately, with no shorts or revealing tops. Be sure to check out Adhere the 13th (a diminutive live blues bar) and Hippie de Bar (a retro-themed bar that is popular amongst the local alternative crowd). If you’re after a more chilled evening, head over to the Eagles Nest rooftop bar (right across from Wat Pho). At Eagles Nest, you can #treatyoself to a traditional style Thai dinner on the banks of the Chao Phraya River as Wat Arun glitters at you from across the river. The Khao San Road is one of the best areas to stay in Bangkok. If you’re suffering from jet lag (or just in the mood for a fun night out), then staying on Khao San Road means that you’re also centrally located for all of the best bars. The Khao San Road contains an eclectic nightlife scene for anyone who wants to look beyond the ‘cheap drinks, plastic chairs and Top 40 hits’ joints set up along the main road. There are few countries as widely adored as Iceland and tourism has boomed there over the last 5 years. This is partly because stopping by for just a few days in the nation’s capital of Reykjavik you can hope to see and explore what makes this island so special. An admittedly small city, it’s quite manageable to explore Reykjavik on foot in a day or so. A perfect place to start is with the monumental Hallgrimskirkja church and its tower views right across the city to the nearby fjords. Another impressive modern landmark is the striking Harpa Concert Hall by the city’s waterfront. It’s also quite nice to stroll around Tjörnin lake and take in the nation’s parliament nearby. Reykjavik is also home to several museums, from the Þjóðminjasafnið on the nation’s history, to the … unusual, like the Icelandic Phallological Museum with its unlikely collection of penises. What’s great about visiting Reykjavik with a stopover flight is that it’s the gateway to the rest of the country. From Reykjavik, it’s easy to combine various day trips or tours to see more of this wonderful island. You can even visit the famous Blue Lagoon spa coming to and from the airport as many travellers do. The most common trip is the Golden Circle route that offers a glimpse into island’s raw beauty and includes the mighty hot springs of Geysir, majestic Thingvellir national park and raging Gullfoss waterfall. Alternatively, boat tours from Reykjavik show off the local wildlife, whether it’s admiring adorable puffins or going off in the hopes of whale-watching. It’s easy to fill up a two or three-day stopover with these sorts of tours. For bars, cafes and restaurants, start with Laugavegur street and its endless offerings, including Le Bistro or Lebowski Bar. For the adventurous, test your mettle and your senses with hakarl, basically rotten shark meat. Quickly chase it with brennivin, an Icelandic schnapps, trust me! More enjoyable Icelandic foods include lamb soups and the local variant of yoghurt called skyr. Reykjavik isn’t a large city, but it’s best to stay roughly between the centre, Hallgrimskirkja and the northern waterfront. This puts you close to attractions, food and nightlife. If you find yourself with a stopover in Shanghai, then hang on to your handkerchief because Shanghai is without a doubt one of the most thrilling cities in the world. Amongst the city’s bright lights, anything and everything is possible. A simple wander through a park may lead you to participate in any kind of activity, from backward power walking to community karaoke. Unless you have the stamina and/or speed of Superman, it’s impossible to experience all that the city has to offer in a stopover. That said, you can experience the highlights reel. It is said that you haven’t really been to Shanghai unless you’ve walked the Bund. Drawing its name from Hindi, the Bund is a waterfront area in central Shanghai that serves as the pride of the city. In my opinion, the best way to experience the Bund is by staying up all night to watch the sunrise behind the skyline from the Bund accompanied only by local tai chi groups. Shanghai is home to countless remarkable nightlife spots that make staying up all night a piece of (alcohol-infused) pie. There’s a dizzying array of bars that cater to every possible niche. Do you want cheap drinks and pop tunes? Then head to Perry’s in Huaihai Lu. Do you want to party like a celebrity, sipping cocktails from a hot tub on a rooftop? In that case, look no further than the Vue Bar atop the Hyatt on the Bund. When it comes to choosing a place to base yourself during your stopover, if you’re nearby to a metro station you’re right where you want to be. This is because Shanghai’s subway system is cheap, easy to use and sprawls the entire city. Los Angeles is a great stop over city based on the sheer quantity of free things to do, meaning that you can have a first class stop over on an economy price. There are plenty of reasons to visit Los Angeles, in particular that LA is the only city in the world where you can truly have it all. Cool surfing spots? Check. Grungy craft breweries? You betcha! What about world class museums and the flashy charm of Hollywood? Just step this way my friend! In LA, the possibilities are truly endless. The culture nerds amongst you should definitely head to LACMA (The Los Angeles County Museum of Art) and wander between the famous lampposts – the perfect photo opp of course! If you’re into fusion restaurants, then a visit to Badmaash is an absolutely must! This trendy American/Indian fusion in the funky downtown district serves up fresh dishes such as Tikka Masala Poutine and Badass Chicken Tikka. If you’re underwhelmed by the glitzy world of Hollywood and you’re looking for something a little more alternative, then head to the Arts District and embark on a craft beer and street art tour starting at the Angel City Brewery. Cheers! One thing that makes LA a perfect stopover city is the proximity of the airport to the city’s awesome beaches. Being a sprawling metropolitan city, you might expect LA’s airports to be further out of town, but you’ll be pleasantly surprised to find the Californian coastline just a stone’s throw from LAX Airport. 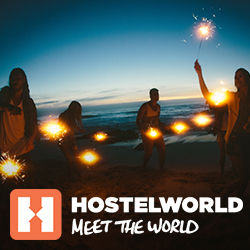 With great beaches comes great accommodation and some of Los Angeles’ best hostels are right on the beach. To choose your perfect LA hostel you’ll first need to decide what kind of beach vibe you’re looking for. The first of LA’s famous beaches is Santa Monica – swanky and chic with high-end restaurants and stores lining the beachfront and that iconic pier with it’s neon fairground. Here, I recommend opting for HI Santa Monica, a colourful hostel right on the beach. The second famous beach in LA is the ever-quirky Venice Beach. Loud, hectic and with countless Medical Marijuana outlets lining its walkway, Venice Beach is definitely the edgier of the two beaches. Venice Beach offers travellers a gnarly free skate park, incredible street art, and tasty AF cheap eats. I recommend Samesun Venice Beach hostel located, quite literally, on Venice Beach with a spectacular view of the palm trees and blue waters. Dubai is a popular stopover city and the airport is a busy hub for flights all over the world. So, the next time you need to fly through consider stopping for a day or two to explore this international metropolis. 80% of the UAE´s population is immigrants making Dubai one of the most international cities on Earth, and it shows in everything from the prevalence of English to the melting pot of cultures and foods. Walking around Dubai can sometimes feel like a trip to the future and no stopover in Dubai would be complete without a visit to some of its impressive skyscrapers. The world’s tallest building – The Burj Khalifa – is located right next to the world’s largest shopping mall and you can easily spend a few hours getting lost in the grandeur. A trip up the Burj Khalifa is impressive if a bit pricey – make sure to book tickets in advance. Given the number of skyscrapers in this city, you might be forgiven for thinking there’s no outdoor space to enjoy – but Dubai has some amazing parks, gardens and white sand beaches. If you’re there in the right season, make sure to check out the incredible Dubai Miracle Garden and Jumeirah Beach. If you haven’t yet been blessed with a stopover at Singapore’s Changi Airport, then you need to rethink your travel plans. The airport is a holiday in itself, but what most people don’t realise is that there is so much more to Singapore than just a really cool airport. A stopover flight in Singapore will have you stepping into magical landscapes like the iconic Gardens by the Bay and witnessing a surprising culture shock in Little India. 48 hours is just enough time to see everything noteworthy and will definitely have you longing for more. Be an early riser and watch the day begin across the bay with the Marian Bay Sands towering over the skyline. Continue to Gardens by Bay and be absolutely mesmerised before the tour groups arrive. You should also aim to be one of the first to walk into the Cloud Forest when it opens at 9am – it’s a total dreamscape. You can’t miss taking a trip out to Little India, where all your senses will come alive. It will feel as though you have stepped into a whole other world. When night falls, tend like the expats and head to Timbre+, a hawker centre that combines local arts and food to die for. If you fancy a view from above without the price of Marina Bay Sands, then Level33 is the place to be. This incredible cocktail bar boasts an incredible view and is a great spot to watch the light shows in the gardens. If you are chasing nightlife, then Clarke Quay and Boat Quay are the prime areas to get your boogie on. Whereas, if you want more of a cultural experience then Arab Street and Little India will spark your curiosity. Singapore is one of the most walkable cities, so wherever you go, you will be able to get to and from with ease. Hong Kong is the type of place where you really want to have a window seat on the plane, especially if you’re flying in at night. This densely populated city glows like a Christmas tree at night and is one of the greatest things about Hong Kong. Hong Kong is a destination that works around the clock, giving you endless things to do and plenty of time to do them. Allow a stopover of at least 48 hours and you’ll be able to delve headfirst into the culinary delights and immerse yourself into the colourful traditions. Or you can even live out those childhood dreams and take a visit to the happiest place in the world, Disneyland. Jump on the Star Ferry from Tsim Sha Tsui to Hong Kong Island and head up to Victoria Peak for the most incredible view overlooking the city. You can stock up on some fresh Nikes at the Ladies Market in Mong Kok and take a walk through the Goldfish Markets to get an idea on just how bizarre things can get here. Being so culturally diverse, Hong Kong is a haven for any foodies and a trip isn’t complete without trying bubbles waffles, a warm pineapple bun or authentic French toast. If you are an avid photographer or just really want to get that perfect Instagram shot, then you can’t miss taking the Hong Kong Tramway to the Yick Fat Building. This will not only look amazing on your grid, but it will give you an insight into what the living conditions are like in Hong Kong. Everything is compact in Hong Kong, so no matter where you are, it’s guaranteed that you will be close enough to attractions or nearby a train station. The two main areas are Kowloon and Hong Kong Island, which are easily connected by the Star Ferry. If you want to have the true Hong Kong experience, then Kowloon is where the city really comes alive whereas Hong Kong Island is designed to give off a city feel with more glitz and glamour. India is one the most unique and diverse countries on the planet. It would take years to see everything it has to offer but a stopover flight in New Delhi is a great way to get a taste (literally and figuratively) of this colourful nation. Delhi is known for being dirty, hot and chaotic but a quick stopover is a great way to enjoy some of the incredible parts of the city without being overwhelmed. Check the weather, download a taxi/rickshaw app and find a central place to stay and you’ll be set for an unforgettable stay in India’s vibrant capital. Some popular sights in Delhi include the Lotus Temple, Jama Masjid Mosque and the Red Fort. These three will easily take up a day of sight-seeing and show a range of architecture, religions and history. To immerse yourself in the sights and sounds of India take a walk through Old Delhi and the Chandni Bazaar where you can see everything from street food being prepared to cows, rickshaws, carts and cars vying for space along the crowded roads. For food and nightlife head to Haus Khaz village, a maze of small streets lined with restaurants, bars and arty shops. During the day, the area is also a top spot because of the surrounding park, lake and historic tombs and mosque which are free to visit. If your stay in Delhi is longer than one day you should definitely consider the 4-hour trip south to see India’s most iconic building, the Taj Mahal. The views of the Taj Mahal at sunrise are unforgettable and it’s worth taking overnight transport or staying a night in Agra to beat the crowds and gaze in awe as the marble structure is bathed in golden light. It’s truly a once in a lifetime experience. Connaught Place and the surrounding neighbourhoods are a popular area for tourists and locals and offer a great range of accommodation, food and transport options. Strategically placed in the Persian Gulf, the Qatari capital of Doha is one of the most rapidly expanding cities in the world. In the last decade or so, it’s become a hotspot for expats looking to take advantage of the low to non-existent tax rates and Qatar Airways customers who have booked themselves onto long-haul stopover flights and want to stretch their legs whilst exploring a new city. Doha is still a relatively small place in a teeny, tiny country, so you can see a lot in a two to three-day layover. Even though Qatar is an Islamic country where Sharia Law is enforced, it still has a pretty decent nightlife (except during Ramadan, when clubs are closed). Many of the hotels have their own watering holes, such as the W Doha and Trader Vic’s at the Hilton. You can’t visit Doha without checking out a souq (market). The Souq Waqif is one worth going to – it’s home to restaurants featuring fare from all around the Middle East, cheap street food and goods sold at various stores – remember to haggle in order to get a fair price. The Museum of Islamic Art is also worth checking out, not only for the beautiful works it encases but for the building which is itself a work of art. I also recommend heading out to the Qatari Desert. Qatar’s Inland Sea is something worth experiencing, along with Richard Serra’s gigantic sculpture, East-West/West-East. If anything, try to schedule some time to hit the sand dunes in a 4WD. It’s as exhilarating as riding the world’s best rollercoaster. Just make sure you go with local experts – don’t be one of those tourists who try it for themselves, only to get bogged down in the sand! I’d recommend staying in either West Bay, located in the heart of the city, or the Pearl-Qatar, an artificial island where many expats reside. Getting around the city is fairly easy – there are buses (which run for free in the city centre) and cabs everywhere. The post Savour your stopover flights with 48 hours in the world’s best layover cities appeared first on Hostelworld Blog.